Winter is here, and that means it’s a great time for soothing teas to warm your insides and ward off those nasty viruses. Recently, Martha Rose Shulman’s Recipes for Health focused on herbal teas and infusions (a friend recently told me that the difference between “tea” and “infusion” is that the latter does not contain any actual tea leaves. Thus, most herbal “teas” should actually be called “infusions”). The following infusion is similar to my super citrus-ginger nectar but has no orange and includes turmeric, cloves, and cayenne pepper. It is delicious — don’t be thrown off by the bright yellow color. The first time I made it, I used too many cloves and they overpowered the whole drink. The next time I halved the amount of cloves and it was just right, allowing the mellow turmeric and soothing ginger flavors to come to the fore. I use more lemon and less honey than Shulman, as per my personal taste — feel free to adjust the proportions to your liking. Make a big pot of this infusion, then refrigerate and reheat whatever you don’t drink in the first sitting. If this doesn’t make you feel healthy and re-energized, I don’t know what will. Put the water on to boil. While it is heating, combine the sliced lemon, minced ginger, cloves, and turmeric in a large teapot (or saucepan, if you have no teapot). Pour the boiling water into the teapot, then stir in the honey. Cover the pot and let the infusion steep for 30 minutes. After 30 minutes, reheat if necessary and pour into mugs. Add a small pinch of cayenne pepper to your mug before drinking. This entry was posted in food, health, recipes and tagged herbal teas, infusion, Martha Rose Shulman on 31.01.2014 by taplatt. This soup may look monochrome and uninteresting, but it has a lot of flavor, thanks to earthy celeriac and fresh thyme. Inspired by one of Martha Rose Shulman’s “Recipes for Health,” the soup was a handy way to use up a huge celeriac bulb that we got in a freebie Abel & Cole delivery (thanks, Sarah!). Throw in some potatoes, onions, garlic, and apples, and you have a well-rounded, silky smooth soup to enjoy on cool autumn evenings. It’s great with German sausages, too — mix them in or eat them on the side. Heat olive oil in a large pot or Dutch oven over medium heat. Add the onion and garlic and cook, stirring, until they begin to soften (5 minutes or so). Add the celeriac and potatoes and cook, stirring occasionally, until they begin to soften, another 5 minutes or so. Pour in the water/stock, and add the apples, bay leaves, thyme, celery seeds, salt, and pepper. Bring to a boil, then turn the heat down and let the soup simmer until the vegetables are tender enough to blend, 40-60 minutes. Take the pot off the heat and blend the soup with an immersion blender (or in batches in a blender). Return the soup to low heat for another 5-10 minutes before serving. This entry was posted in food, full meals, health, pictures, recipes and tagged Martha Rose Shulman, soup, weeknight dinner on 04.12.2013 by taplatt. We (i.e. my parents) have been getting loads of delicious cherries from the summer CSA in the past couple of weeks. I keep running across great-looking cherry recipes and finally found myself with most visa stress behind me and a free Thursday afternoon on my hands. I decided to take a stab at another one of Martha Rose Shulman’s great “Recipes for Health” on the NY Times. 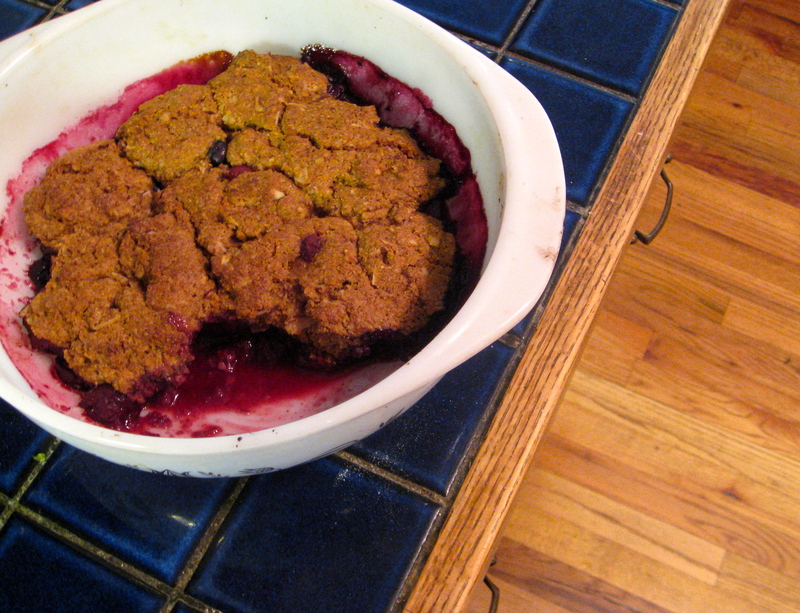 This time, I modified her recipe for Cherry Cobbler with Almond-Buttermilk Topping. We didn’t have enough cherries, however; nor did we have buttermilk. 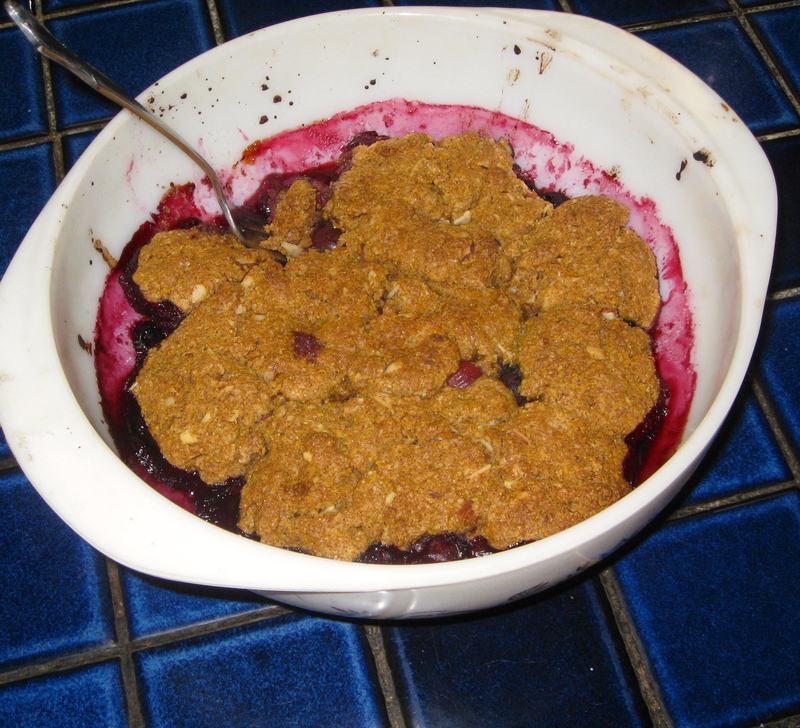 So I bulked up the fruit with some leftover blueberries and used almond milk instead of buttermilk. Tangy, ever-so-sweet fruit pairs nicely with the crunchy topping that has a mild nutty taste and just a bit of sweetness. My parents gave it rave reviews: My mom said, “I like the tartness of the cherries plus the blueberries, and the topping is nice ’cause it’s not too sweet. It was just overall very excellent.” And from my dad: “I loved it. It was delicious. I liked the crust — the cobble-part — especially.” If that’s not a recommendation to go make this, I don’t know what is! This cobbler smacks of health (while remaining tasty), with no white flour in sight, just a little sugar, and some token butter for richness. You could totally eat it with Greek-style yogurt for breakfast or brunch. Three Years Ago: Let the language-learning commence! Preheat the oven to 400F (200C) and butter a brownie pan-sized baking dish. Prepare the fruit: Combine all ingredients in a bowl, mix, then pour into the baking dish, making sure to scrape all the juices out. Make the topping: Whisk together the dry ingredients. Work in the butter with your fingers until the mixture resembles coarse meal. Stir in the almond milk until a dough forms. Plop small blobs of dough on top of the fruit; most of the fruit will be covered but it’s okay if some peeks out. Bake for 25-30 minutes or until the top is browned and the fruit bubbles. Serve warm or cold, with yogurt or ice cream. This entry was posted in family, food, health, pictures, recipes and tagged breakfast, brunch, Martha Rose Shulman on 14.07.2013 by taplatt. Preheat the oven to 375 degrees F and lightly grease a baking sheet or two. Sift together the flour, cornmeal, sugar, baking powder, soda, salt, and allspice. Dump the mixture into a food processor, add the butter and lemon zest and pulse until the mixture is slightly coarse but even. In another bowl, whisk together the egg and buttermilk. Turn on the food processor and slowly pour in the egg mixture. Turn off the processor as soon as the dough comes together (it will be a pretty wet dough). Add the cranberries and pulse a few times to distribute them throughout the dough. Drop heaping tablespoons of batter onto the baking sheets. Bake in the middle of the oven for 14-16 minutes, turning the baking sheet front to back halfway through. The scones will be lightly browned. This entry was posted in family, food, health, pictures, recipes and tagged breakfast, brunch, cranberries, Martha Rose Shulman on 10.12.2012 by taplatt.